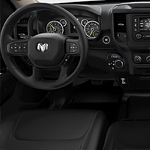 At Ram Country Chrysler Dodge Jeep, we’re excited to show you the interior of the Ram 1500 so you can see why so many people say it’s one of the most luxurious pickup trucks on the market. With various trim levels, you can even decide which one meets your needs the best. Premium leather, a full instrument panel, and a spacious interior are some of the top features. Of course, the console is configurable in three different ways. A Uconnect system gives you access to entertainment and navigation. The pinch-and-zoom features of the 12-inch screen provide you with added convenience, too. The Ram 1500 has best-in-class rear leg room and the rear seats even recline. The dual-pane panoramic sunroof is sure to impress day or night. We can’t wait to show you more about the Ram 1500. Stop by for a test drive in Mineral Wells today!